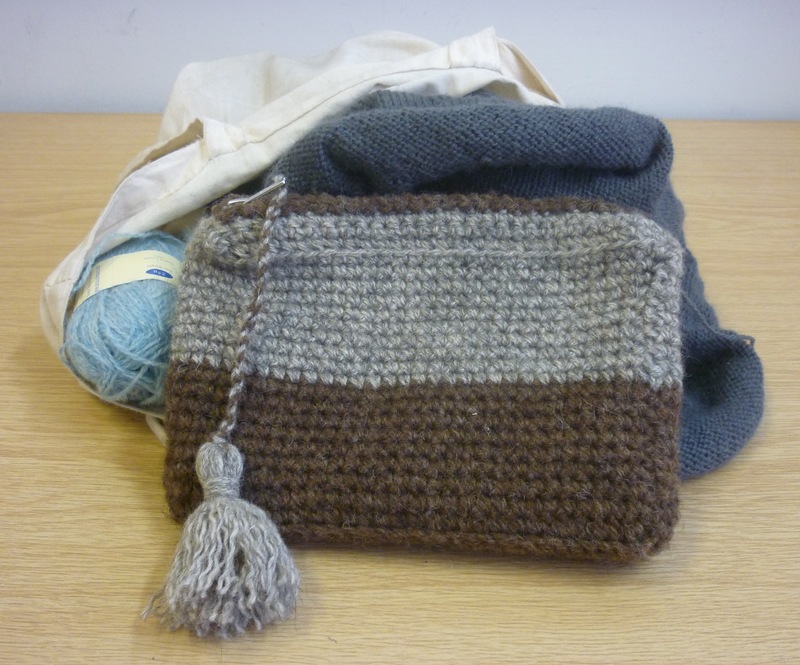 The competition for the Sanquhar Pencil Case Pattern and wool Giveaway is now closed. Which means I have selected a winner! Is something for which I do hanker! this season, or lose with no rancour! Not only because my limerick skills are well below par: I would struggle to find just one word to rhyme with ‘Sanquhar’, let alone two! But on a different level I really like the whimsical idea of matching a physical object with something cerebral. Congratulations to Samantha, I have contacted you for your details, so I can send you your wool. For everybody else, the pattern is for sale at Prick Your Finger, who also stock a range of Jamieson’s Shetland Spindrift, to make a pencil case in whichever colour combination you fancy. Dear readers, it is with great pleasure I can present to you tomofholland’s very first pattern. 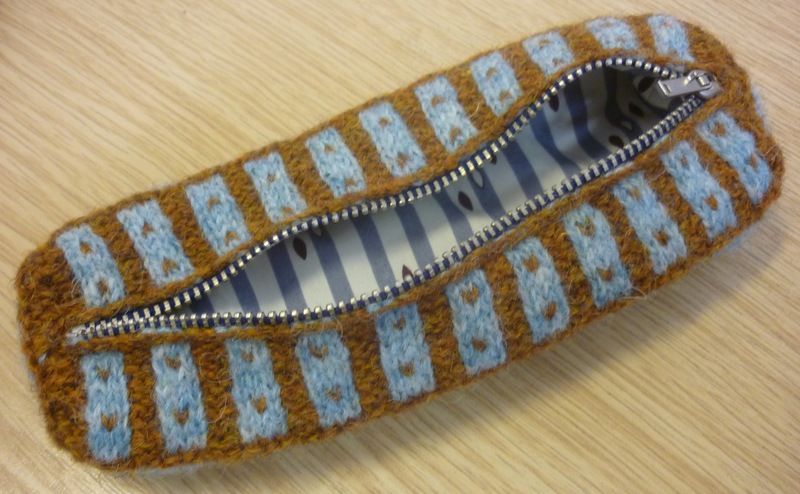 The Sanquhar Pencil Case Pattern is now available for download in the Prick Your Finger webshop. The pattern comes with an alphabet and blank name plate chart, so you make your own initials! 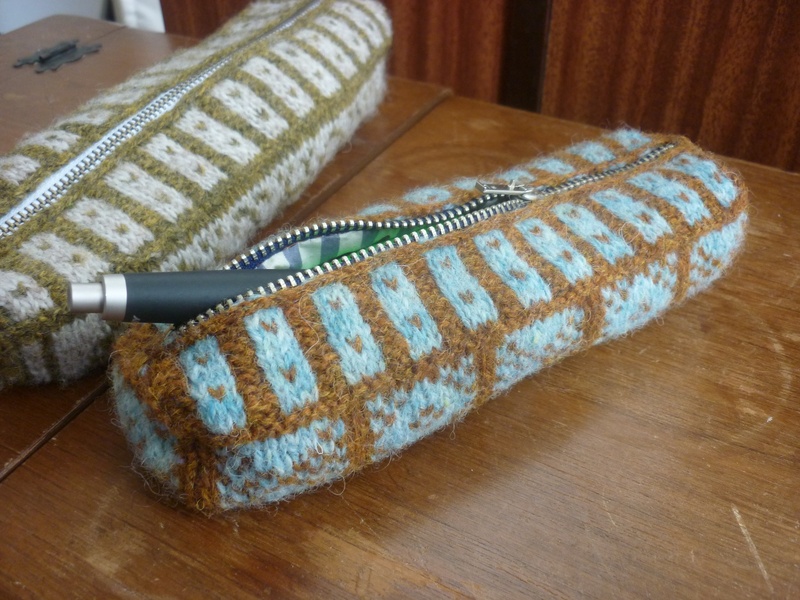 The original pencil case was knitted on double-pointed needles and required grafting the bottom closed. I was very lucky that Dr Felicity Ford offered to test-knit my pattern, as apart from invaluable feedback on pattern lay-out, she also brought to my attention Judy’s Magic Cast-On. This means that this pencil case is completely SEAMLESS. You cast on. You knit. You cast off. You’re done. For the pencil case I used some left over fabric from a pair of boxershorts to line them. Who else can boast a matching pencil case and pants? Releasing my very first pattern is a cause for celebration in my book, so one lucky winner will be given a free copy of the pattern, and two balls of Jamieson’s Shetland Spindrift, in burnt umber and surf, to knit your very own Sanquhar Pencil Case. To enter, leave a comment below and tell me what you think is just the thing to co-ordinate the pencil case with this season. 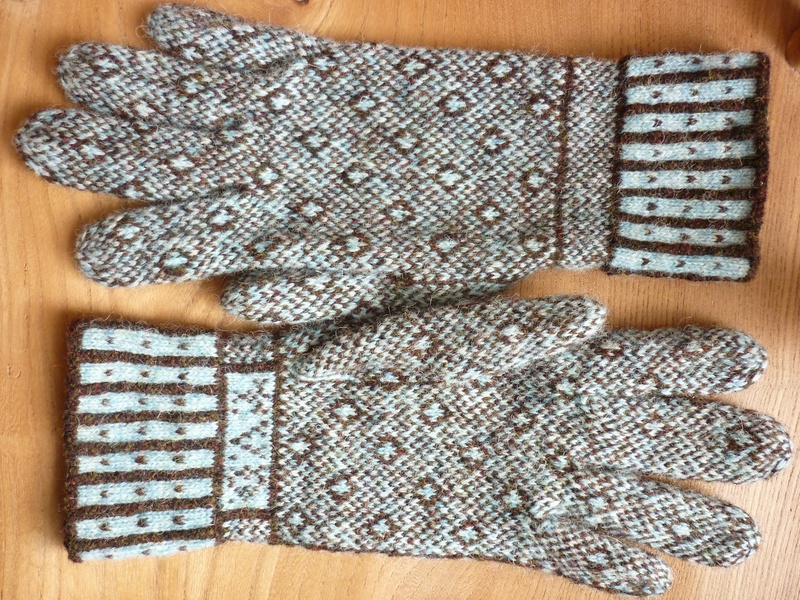 After two weeks, I will select the most amusing answer and post the pattern and wool to the lucky winner. It was a lot of fun to make. Crochet has the advantage that it’s really quick to execute, and if it’s not to your liking, it’s very easy to undo and start again. I embellished my bag with a plaited cord and a tassel. 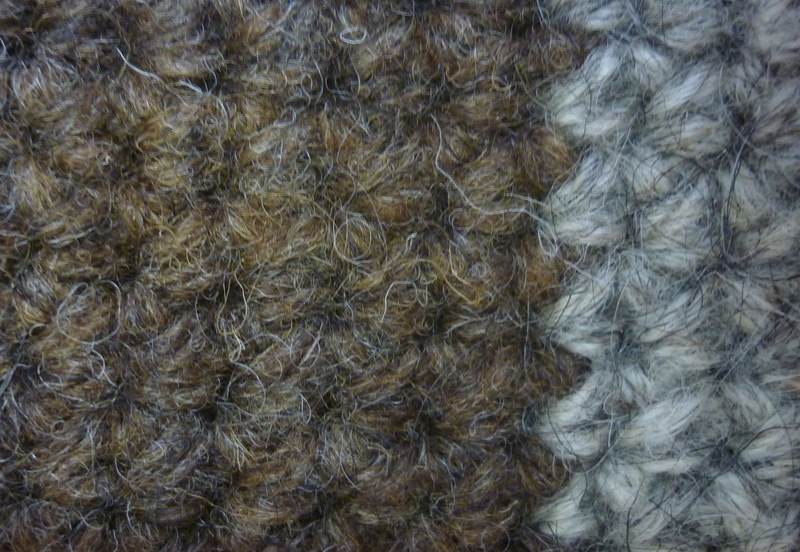 Despite the muted colours and, dare I say it, plainness of the wools, it adds an understated touch of luxuriousness. For the notions bag I have used canvas, as I frequently have DPNs, crochet hooks and other sharp, pointy things rattling around in it and canvas is sturdy. For the pencil case I used some left over fabric from a pair of boxershorts. Who else can boast a matching pencil case and pants? I have enjoyed all the hand stitching this involves. In both cases I first installed a zipper and then added the lining. 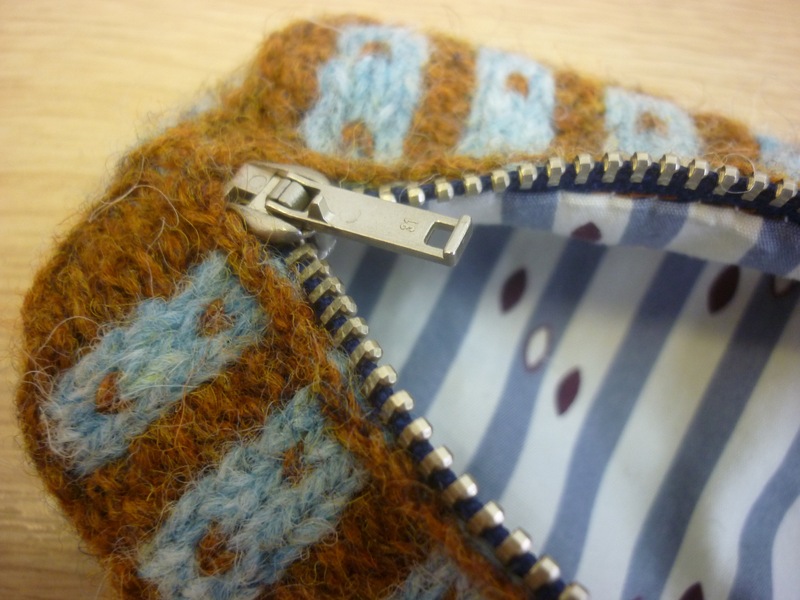 I’m particularly fond of the tiny stitches that attach the lining to the zipper band, as they are nigh-on invisible. My thread snipper also needed its own little wallet. The thin plastic case it came with didn’t really stay on very well, so I made one from layered canvas. Thanks to my indestructible Singer sewing machine, stitching through four layers was a doddle. These very practical objects give me a lot of pleasure in their everyday use. They are unique, and well made, using quality materials. Both items replace bland and boring cases I bought on the High Street. 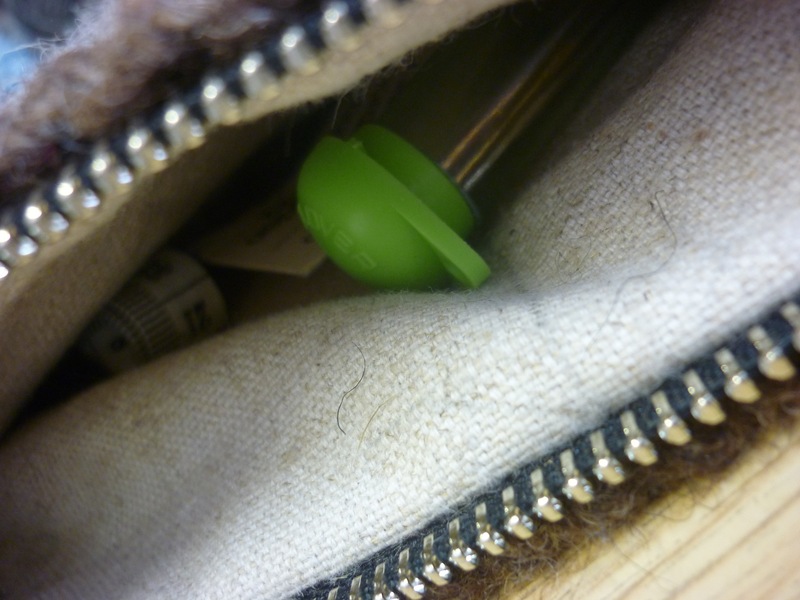 The notions bag replaces one which had gaps at the end of the zipper. They were there to add some ease when opening and closing it, but it also meant that small things kept falling out. The pencil case replaced a tubular affair. It was made from some really light, yet stiff material, and for some reason it would always roll so that zipper faced down. But only when I left the zipper open. Pens and pencils kept falling out. I never thought about all this when I bought these items, but I got fed up with these minor annoyances. So although I’m pleased to have replaced notions bag and pencil case with unique pieces, they would never have turned out this way if I hadn’t used their generic predecessors. The Notions Bag is Raveled here. The Pencil Case is Raveled here. 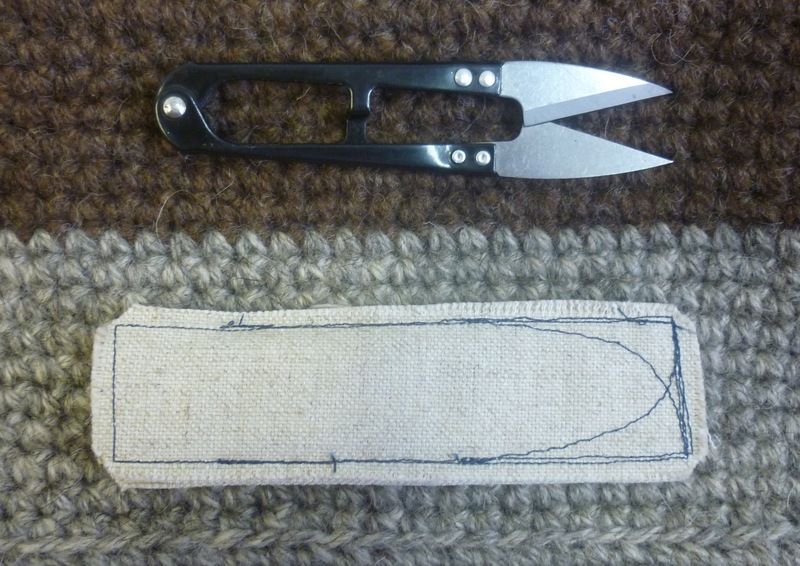 *) As an aside: it won’t be too long before I can release a pattern for the Sanquhar Pencil Case. Keep an eye out!